Home 2019 Train Schedule Our Trains FAQ Jim Thorpe Attractions Customer Testimonials Contact Us! 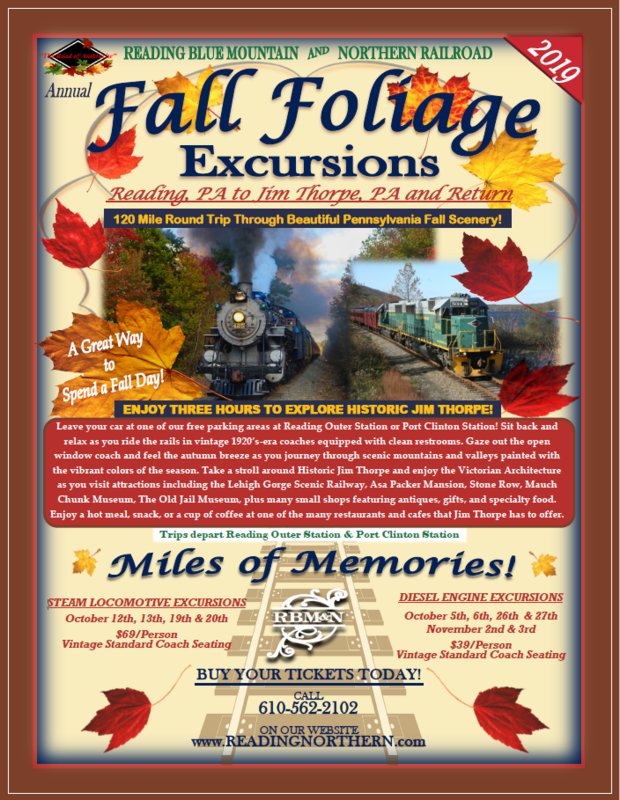 Steam Train Dates: October 12th, 13th, 19th & 20th Buy Now! Visit www.lgsry.com and www.jimthorpe.org for more information when planning your trip to Jim Thorpe. No ticket sales day of the trip. Tickets may be purchased in person at the Passenger Department Offices (Schuylkill Haven Train Station) at 12 West Main Street, Schuylkill Haven Monday through Friday from 8:30 a.m. to 5:00 p.m. or by calling 610-562-2102. Tickets are mailed approximately two weeks prior to the trip. All unused tickets are good forever! For pictures and more information about seating options, click the “Our Trains” tab. All cars will be heated in cool weather and contain clean men’s and ladies’ restrooms.